Display an alert or action sheet when your app requires additional information or acknowledgment from the user. Alerts and action sheets interrupt your app’s normal flow to display a message to the user. In Figure 1, the left image shows an alert and the right image shows an action sheet. The user dismisses an alert or action sheet by selecting one of the listed options. Because alerts and action sheets are an interruption, use them sparingly and only when absolutely needed. For detailed guidance on when to use them, see iOS Human Interface Guidelines. To display an alert or action sheet, create a UIAlertController object, configure it, and call its present(_:animated:completion:) method, as shown in Listing 1. Configuring the alert controller includes specifying the title and message that you want the user to see and the actions the user can select. You must add at least one action—represented by a UIAlertAction object—to an alert controller before presenting it. // Create the action buttons for the alert. // Respond to user selection of the action. // Create and configure the alert controller. On iPad, UIKit requires that you display an action sheet inside a popover. Figure 2 shows an action sheet anchored to a bar button item. 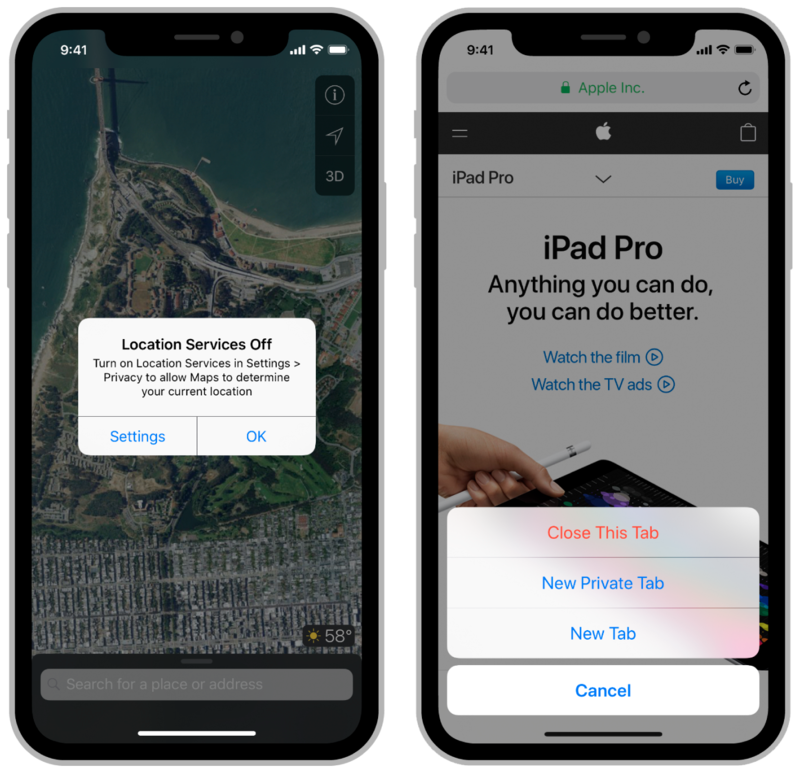 To display your action sheet in a popover, specify your popover’s anchor point using the popoverPresentationController property of your alert controller. It is safe to configure this property regardless of the underlying device. 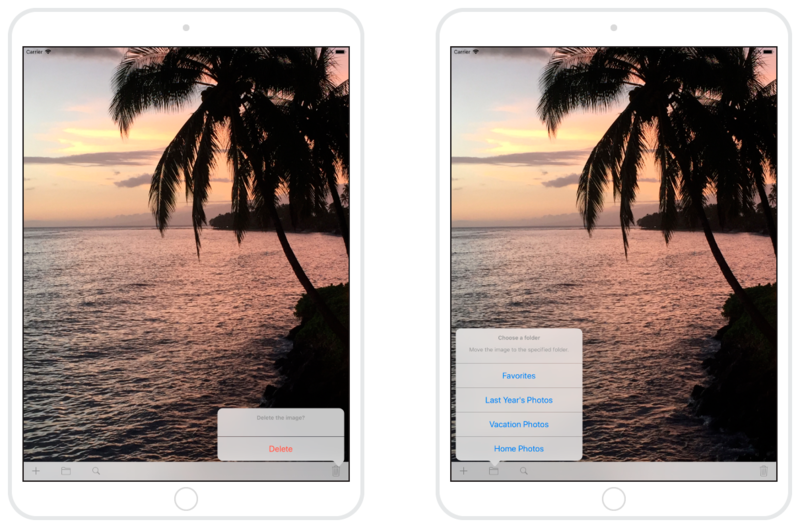 In other words, Listing 2 displays the action sheet in a popover on iPad and as a slide-up presentation on iPhone. // On iPad, action sheets must be presented from a popover. If your set of actions includes a button configured with the UIAlertActionCancel style, UIKit removes that button when displaying your action sheet in a popover. Tapping anywhere outside of the popover has the same effect as tapping the Cancel button, including calling your action handler.